US$ 1300 / person ? 3 Thimphu – Gangtey (Phobjikha) Transfer to Wangdue Phrodang over Dochu-la pass (3010 m) with visit of royal temple Druk Wangyel lhakhang. In clear weather you have good chances for panoramic views of mountains, including Gangkhar Punesu (7570m), the highest mountain of Bhutan. Descend to tropical valley of Punatsang chu river. Soon after lunch you will start driving up to the mountains again until you reach pristine Phobjika valley (2750 m). Optionally you can attend lesson on Buddhism led by accomplished master with translation to English in Gangtey monastery shedra (buddhist college). You might also like to spend overnight in welcoming local farmhouse or even try the hot stone bath, traditional Bhutanese treat. 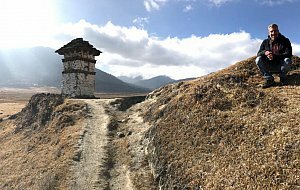 4 Gangtey (Phobjikha) – Wangdue / Punakha Visit of historical Gangtey gompa. 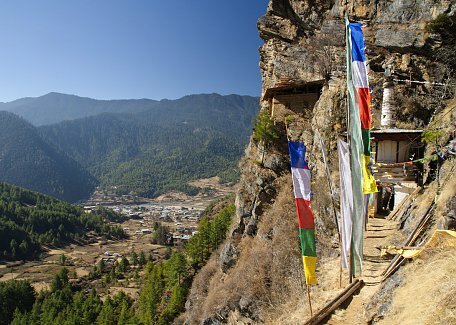 2½ hour walking tour through the valley is one of the most beautiful and easy hikes in Bhutan. You will go through the buckwheat and potato fields to the mixed forest with trees decorated with old men's beard lichen and finally you will get a view of marshland. Here, in late autumn and winter, rare black neck crane can be seen. Finish hike with the lunch in local farmouse to taste local kitchen and other delicacies like the salty suja tea and ara spirit. Drive back to Wangdue. Afternoon walk to Chhimmy lhakhang temple, devoted to 15th century saint Drukpa Kunley, know as “Divine madman”, who did taught Buddhism by singing, drinking and rampant sexual behavior. 5 Wangdue / Punakha – Haa See the longest suspension bridge in Bhutan stretching the length of 350m over Pho Chhu river. Visit of Punakha dzong, which counts as the most intricately decorated castle in the kingdom. After this we will start driving to Dochu-la pass and then descend to Thimphu and will continue drive to Haa valley. On the way we can shortly stop to see 15th century Dobji Dzong castle monastery, which is said to be first building of this design ever built in Bhutan. Overnight will be spent in local farmhouse as a guest of local family, with trying local delicacies like salty butter tea, and ara spirit. Accommodation facilities are rudimentary but experience is worth of it. Optionally you can spend night in hotel if simple facilities are not your cup of tea. Evening option to try hot stone bath, traditional Bhutanese treat. Include Gasa hot spring (1 day): See Gems of Western Bhutan II, 9 days program for that.